From the time I have posted the picture of Naan with a Curry, there were many assumptions made by my fellow blogger friends with regards to the curry being accompanied with Naan and many eager friends are waiting for the recipe of the same. Let me reveal the Curry which is eagerly awaited by all......Its rich Mughlai Malai Kofta!!! Malai Kofta has always been my special curry for special Occasions due to its richness of Cream and Dry Fruits and aromatic flavours. 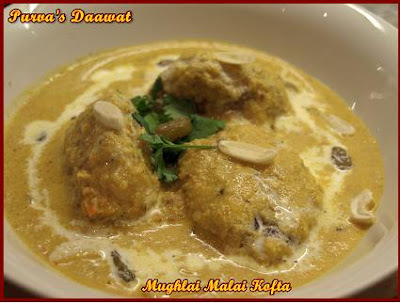 Malai means Cream, the koftas are served in a creamy gravy. 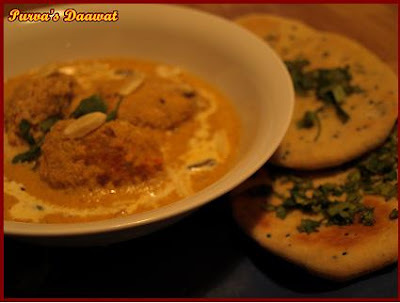 Malai Kofta taste best when accompanied with Naan or any Parathas. 1. Boil the potatoes and mash them finely. Now grate the paneer. If using Ricotta cheese instead of Khoya bake the same in Microwave, the cheese will crumble and it will be like Khoya. 2. Mix paneer and khoya / Baked Ricotta cheese along with chopped green chillies, coriander powder, turmeric powder, salt, Cardamom powder, cashew nuts and kish mish. 3. Add cornflour to mash potatoes and a pinch of salt, be careful with the salt as we have already added salt in paneer and khoya mixture. 4. 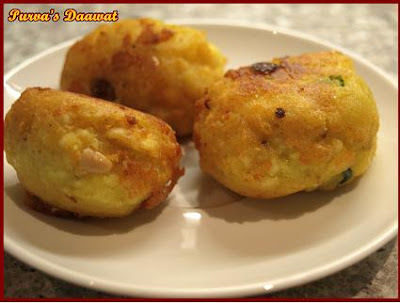 Make shape the potato mixture like a bowl / Katori and stuff the paneer and khoya mixture in it and close the potato mixture and make a round koftas. 5. Deep fry these koftas in oil. Keep aside the koftas. 6. Soak poppy seeds in water till they are soft. Now blend Onions, Almonds, Cashew nuts, soaked Poppy seeds and Green chillies in to a smooth paste. 7. Blend tomato in to a puree, I have used only one tomato as I didn't wanted to change the colour of my gravy in to red. 8. Heat ghee / Oil and add cloves, Badiyan, Javantri, Cinnamon stick. Once you start getting the smell of these whole masalas add Ginger - Garlic paste and saute them for 1/2 minute. 9. Add Onion, dry fruit and poppy seed paste to it and saute till the mixture turns light pink in colour. 10. Add tomato pure, coriander powder, turmeric powder and saute till oil / ghee starts leaving the sides of the vessel. 11. Add salt, cream and garam masala powder and mix in the gravy. If the gravy is too thick add 1/2 cup of water. And the gravy is not thick add more cream to give a thick consistency. 12. When the gravy is cooked, before serving place the koftas in the serving bowl and spread the gravy on top of it. Garnish with chopped dry fruits, Coriander and Cream. Serve it with Naan or any Parathas. I would like to share the same with my fellow blogger friends.. The Malai Kofta looks so delicious, rich and creamy. I have't made this at home before but have been meaning to..
Congrats on your awards and thank you so much for passing it to me - very sweet of you. Delicious malai kofta purva..am drooling now here..mouthwatering dish dear. woww... so rich and yummy... will bookmark it for future reference. Rich,creamy,heavenly.The recipe is first time.I love it.But it definitely involves a lot of work,ofcourse the effort is worth it.Lovely. Hi, this kofta looks yummy .congrats on all your awards.Moreover, I have a gift for you. (May be a repetition, but I feel like sharing this with you ...because U inspire me a lot). Koftas in luscious gravy are best complements with Naan. Malai koftas is one of my favourite curries,I was looking for its recipe. Glad to find it in your blog. And must say u have a great blog with great recipes. This sure must have tasted heavenly as it has a lot of ingredients.....very rich purva. Love the creamy gravy,the koftas look good just as it is too. malai kofta looks so good Purva! Tempting picture. Congrats on all the awards. Looks so soft n nice purva!! this is one of my fav gravy for butter naan!! yummmy! Malai Kofta looks very rich and delicious. Mouth watering. Congrats on ur award dear. And Thanks a lot for passing this on to me also. Btw : I tried your naan recipe and it came out perfect and wonderful. The MalaiKoftalooksdelicious,perfect and creamy purva.Congrats on your awards. Congrates for ur award dear. n ur malai kofta recipe is very good. I bookmarked it. looks very tempting nad mouthwatering. Wow looks rich, creamy, tempting and yummy. I just have to try out your Kofta recipe...I always order this at an Indian restaurant...time for me to make it at home! also, thank you for the award, how nice of you! malai kofta looks delicicus and rich..congrates on ur awards..
Oh my fav dish, malai kofta looks delicious, jus yummmmm!!! Nice entry Dear.. looks perfect..
the malai kofta looks delicious! Creamy and very inviting....love it! Malai kofta is something I always love to order when I go to the restaurants. The malai kofta made by you looks awesome Purva....Iam sure you guys must have enjoyed a lot eating restaurant style at home. The Malai Kofta looks very delicious,Perfect , rich and creamy. I'm so craving a creamy malai kofta now. we make it with a little bit if kaddu...but this version looks sinfully delicious! thanks for dropping in on my blog and the nice words, purva. lip smacking koftas and congrats for the award dear. check out mine too for a sweet surprise. Hi Purva, ur Malai Kofta looks perfect!! Thanks for dropping in my blog and ur kind words. I tried the recipe. It came out very well. Only thing is I cannot make the potato bowls properly..it was very sticky to make the bowls..Instead i mixed grated potato and paneer with corn flour, stuffed khoya inside and deep fried them...It was so delicious that everybody that it had the restaurant finish..thanks to purva..
Soma, I am glad that you tried this dish and everyone enjoyed at ur place. Adding grated potato and paneer along with cornflour was a nice solution for making koftas.